What gives you the authority to speak on any subject, let alone one as important and all-encompassing as Vacation Bible School? you ask? 1. 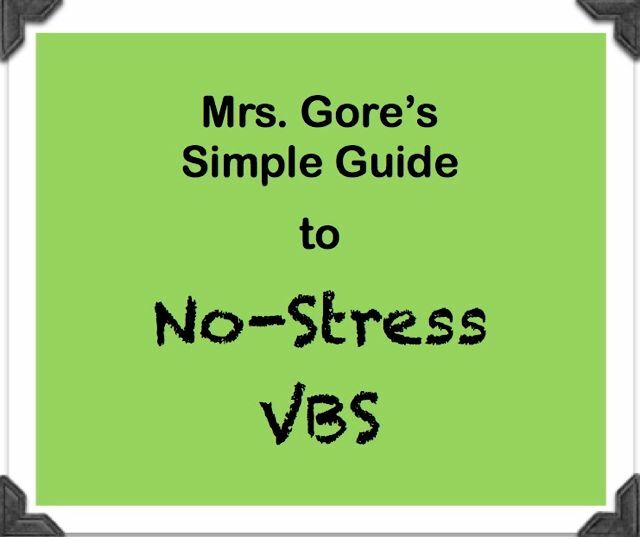 I am Mrs. Gore, first lady of my church. 2. I happen to attend (BY THE AMAZING GRACE OF GOD) a church body that is super laidback and kind, one that a) has the most non-stressful VBS I’ve ever heard of and b) has no problem with their pastor’s wife addressing herself as “the first lady”. (or if they do, they keep it on the down low). To prove my point, let me show you a picture of our VBS decoration. That’s right, I said decoration. I got so tickled everytime I saw this inflatable car. To promote our Bible School, our director (and my truly incredible friend), Chrissy, had it hanging from a string in the foyer (and my kids were obsessed with it…). And then when it was time for VBS, she moved it on the stage of the sanctuary in front of the promotional VBS poster that came with our curriculum (after she cut the Sharpie-written dates and times off the bottom of the poster). Who knew a VBS decoration could bring such joy and multi-faceted entertainment to the children of our church? It’s a ceiling fixture. It’s a centerpiece. It’s a ride. Our inflatable car knew no bounds, really. Okay, okay, I might be exaggerating a little bit. It wasn’t our only decoration. There was also some crepe paper and some posters and some sheets and tablecloths draped over stuff. Between Sunday and Monday, while I was at home chasing after the chaos that is my family, several very sweet and hard-working ladies (including Chrissy) gave up their time and energy to turn our church into a welcoming, festive and kid-friendly atmosphere. But my point is – and what that car represented to me all week – Vacation Bible School, a week that can sadly be known for its drama and stress and division and expense, can…and SHOULD…and MUST…be a week of simplicity, fun, unity, togetherness, and most importantly, gospel love. And this past Sunday night, as I watched the children of our church (and several from the community) cluster around my husband on the stage, answering impromptu questions about what they had learned this week, singing a few great hymns and a few fun songs, feeling comfortable and happy and doted upon in their church home, I was so pleased at what God has done among us. The tension that can sometimes surround weeks like VBS and church camp and every single extra-biblical event just doesn’t exist. And the stiffness of a stilted and nervous performance at the end of the week is not necessary. But most importantly, more and more with each passing week, church feels as warm and cozy as…home. Such was the atmosphere of our entire week together, and even though we were dead on our feet by 8:30 p.m. each night, it was glorious and the kind of stuff from which the sweetest memories are made. And get this…aside from the nightly meals we shared together, the entire week cost us about $200. Get out, Jack! And so I simply wanted to encourage you today. If you have the time and talent, if it brings you joy and peace, and if it helps you to meditate on the coming week of ministry, feel free to completely trick-out your VBS rooms with the coolest decorations you can dream of. Likewise, when you are planning the format of your VBS – night or morning, 3 hours or 4 hours, meals or no meals – maintaining a spirit of love and unity, feel free to continue to do things as you’ve always done them or completely change the way you’ve done things before. take a step back and remember what weeks like VBS are supposed to be about: having fun, sharing the gospel, teaching young hearts, enjoying the brotherhood, and, mostly, saving young mothers like me from going off-the-charts insane in the midst of long summer days of heat and boredom. Regardless of what curriculum you use, let these things be the ANNUAL theme of your Vacation Bible School, and I promise you, it will be a roaring and happy success. For, true to John 13:35, the children you are ministering to will be won to Christ FAR more by your love for one another than by the impressive and grandiose whirligigs you built in the church foyer or the tick-tock-timely manner in which your schedule runs. You can have all of the above, but never, ever sacrifice the former for the latter. 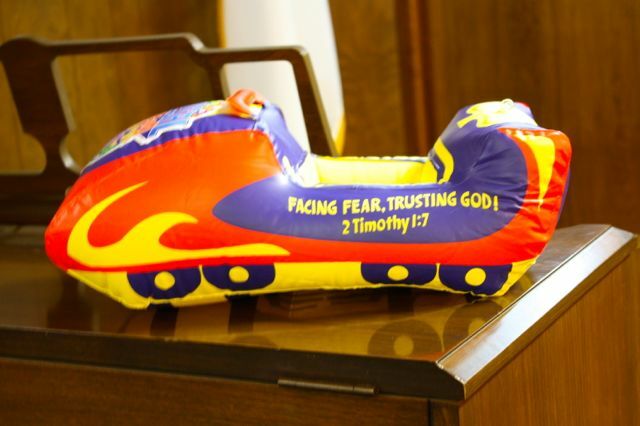 Now if you’ll excuse me, I need to conclude this happy ending by riding off into the sunset in my inflatable VBS car. Want to remember or share this? Pin it!